This book wasn't even about the same thing the synopsis led me to believe it would be about. Well, either that, or I totally misinterpreted it. 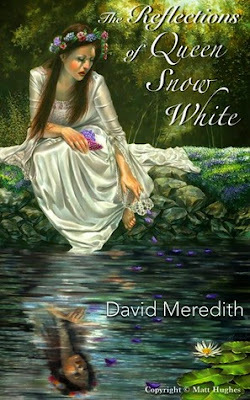 I thought the novel would be something along the lines of the mirror telling her to do something, and Snow White going on an adventure to find her happily ever after (that sounded better in my head). Turns out, it's actually a coming-of-age story, one that picked apart the beloved Snow White, and turned her into something so shallow, weak, and selfish, that I could barely stand to look at her without despairing. The beginning started out promising, despite the fact that it took up about a tenth of the book. The descriptions were so much like you'd imagine a Disney movie to be, and as a fan of Disney, I couldn't really ask for anything more. After that, it started plummeting, if only in my eyes. We're introduced to an older Snow White, who has ignored her daughter and wallowed in self-pity ever since her husband, Charming died. From that very first moment, I started hating her. It would be okay if she was a normal woman I guess, but honestly she reminded me so much of the Evil Queen, Arglist, that I wasn't sure if Snow was good or bad. I love my princesses bold and strong, or at least kind, and it seemed that this princess was neither. I later learned that this Snow White is based on the Brothers Grimm version, but it really did burst my I love princesses bubble. I mean, really, would Snow White offer the last remaining dwarf to work for her at the castle, instead of inviting him as a guest?! She was just...ugh. Of course, there were still more things wrong with her. The biggest was probably that she cried at least 4 times within the first 10% of the novel, and considering how short this book was, that's a lot of crying. Basically, all she did for the entire beginning of the story was cry, ignore her daughter, complain about how alone she was in the world (ignoring the fact that she has a daughter), and avoided happiness, just like the Evil Queen. You see my point? And she only recognized how foolish she was exactly once, though she didn't do anything about it. So yeah, you can see why I didn't like Snow's portrayal in the story. I haven't had to face death, so I can't even comprehend the pain someone would go through. She may very well avoid happiness, and being happy might feel like a betrayal. I cannot understand what someone goes through, but that's why I read fiction, so whether or not Snow White's behavior is accurate, being the stubborn girl I am, I cannot agree with the death of Charming causing her to completely cut herself off from her child. The other part of the story, the reflections, they were interesting. They told a different story of Snow White's life, and while it was violent - true to the the Brothers Grimm version - it was also intriguing. There were parts I didn't appreciate, for example, that Charming was 30, and Snow 17, when they married. But then there were other reflections, like Snow White's treatment under Arglist, that were so intriguing. There was a reflection in which Snow tried to escape from Charming (it's not what you expect), and another where Snow believes herself to be superior to the courtiers. If you know me, you know I like perfect, and because the stories in this book were anything but, they didn't always appeal to me. The ending was wholly expected, though the novel finished off a bit too quickly. I found it weird that the introduction took about 10% of the story, while the ending took about 2%. Because of this, the "happily ever after" felt a bit rushed. Also, the second to last line in the book, I'm pretty sure it was meant to be a reference to the Snow White everyone loves, but it just annoyed me, emphasizing the character's shallowness. And the last line...well, that's not exactly how I'd prefer my novels to end. It is unusual for a coming-of-age novel to be centered on an older woman, and the author managed to do so in a way that that kicked all past perceptions of the princess into the trash. I wouldn't recommend this novel for anyone looking for a plot filled with action or romance, but people who would enjoy reading other versions of Snow White's tale, or fans of the Brothers Grimm, might give this a try. The writing in the novel was great, as was the setup; it was only the criticism of a cherished princess that fueled my discontent with the book. Nevertheless, as I haven't actually read the Grimm version of the fairytale, I do realize that I'm not a proper judge on the novel. Book Synopsis: What happens when "happily ever after" has come and gone? Source: Received a copy from the author for review.